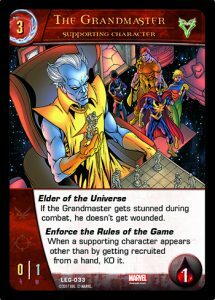 Within the Marvel universe the Elders of the Universe are some of the oldest living beings. They are known for their personal obsessions such as collecting, gaming, and fighting. In last week’s preview we showed you a couple characters that can appear from unexpected places. The Grandmaster is all about playing games, and he doesn’t like it when you break the rules. His low ATK and DEF usually prevent the Grandmaster from participating in the battles he sets up. However, if you do find yourself fighting him, being one of the Elders makes him not so easy to KO. This is also a good time to remind players of the timing rules in the game. In a situation where a character that has its own appears trigger enters play, both triggers will happen. The turn player will decide the order in which those triggers will resolve, but they will both resolve. In a situation were multiple characters are coming into play at the same time, the turn player is only deciding the order the triggers are resolved, not the order the characters are coming into play. The turn player will decide the order in which those triggers will resolve, but the main point is they will ALL resolve. For example, Wasp has Sting. 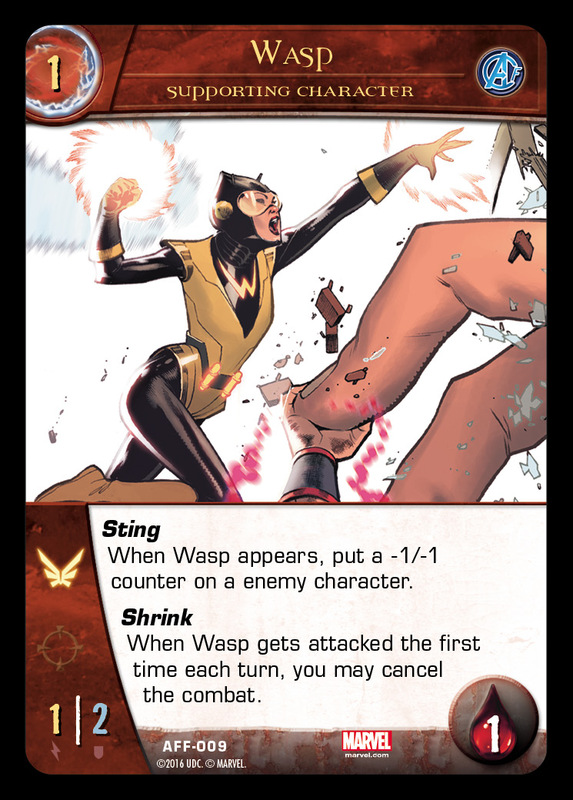 If Wasp were to enter play without getting recruited, both Sting AND Enforce the Rules of The Game would trigger. In this scenario, both will KO each other and it does not matter which order it happens. If the turn player chooses to resolve Sting first, The Grandmaster will be KOed, but Enforce the Rules of The Game will still resolve and KO Wasp because it exists independent from the source that created it. 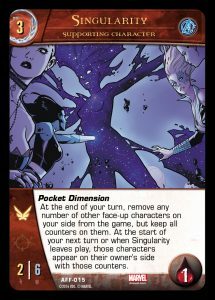 Our next example will be with Singularity which has Pocket Dimension. The basic question is, what happens if Wasp, along with a few of her friends, are all in the pocket dimension and Singularity leaves play? First of all, all the characters enter play at the same time. Next the turn player will decide what order the appear triggers will resolve. 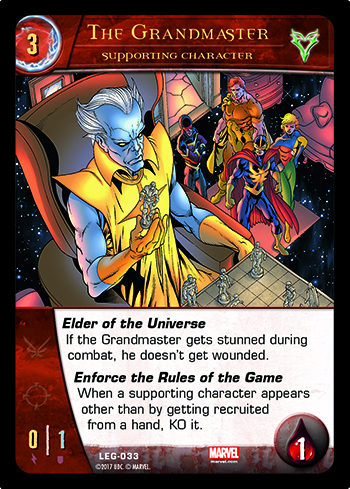 There will be at least one for each character that came into play from The Grandmaster and one from Wasp. 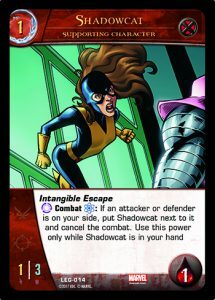 Even if the turn player decides to resolve Sting first, all the Enforce the Rules of The Game triggers will still resolve and KO Wasp and friends. Of course this may seem more complicated if each character coming into play has its own appears trigger, but the resolution is the same. Figure out all the triggers that happen, and then resolve each one, one at a time, in the order the turn player wishes. 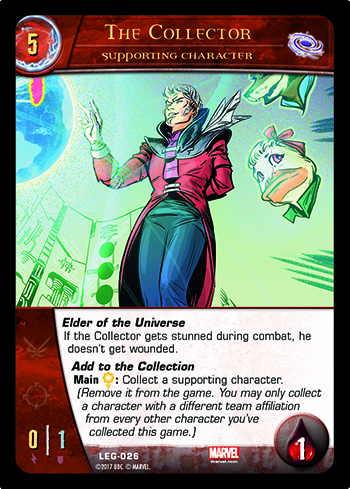 The Vs System® 2PCG®: Legacy expansion also includes another Elder of the Universe. The Collector loves, well, collecting things. As long as they’re special. Keep in mind if you play multiple Collectors over the course of the game, they will all use the same “collection”. 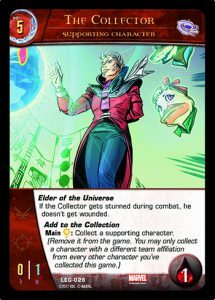 For example, if the first Collector collects a character from the Avengers and one from the X-Men, then later on you play another copy of the Collector he will NOT be able to collect an Avenger or X-Men character. The idea behind the Lethal keyword is that when an attacker with it defeats an enemy supporting character in combat it KOs that character regardless of the defender’s health. It’s much like the attacker putting extra wounds on the defender. Originally we tied the Lethal moment to when the attacker “stuns” the defender. However, the game has evolved and added new ways for characters to become stunned without gaining a wound. Examples of this are the Daze mechanic or the Elder of the Universe keyword above. We realized that the Lethal moment makes more sense when the attacker “wounds” the defender, as opposed to when it “stuns” the defender. When this character stuns a defending supporting character, KO it. When this character wounds a defending supporting character, KO it. In the vast majority of cases it will play as before: A lethal attacker stuns, and therefore wounds, a defending supporting character with 2 health or more, and the defender gets KO’d. But in some corner cases Lethal will play more honestly and thematically. Now a Lethal attacker can’t use a Daze effect to KO someone. 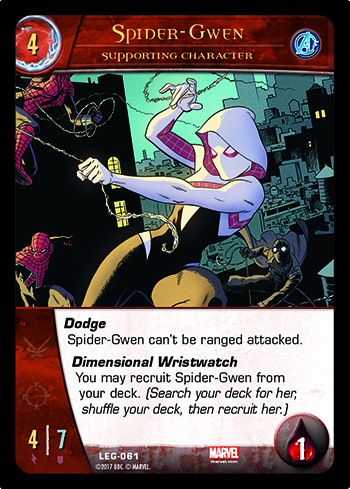 And Lethal won’t KO a character that can’t be wounded in combat, like those pesky Elders of the Universe. We hope you enjoyed today’s preview. Tune in next time as we twist things up. If you missed our other previews you can find them in the links below.